DULAS, a renewable energy company, recently received a order from the health ministry of Ghana. Their goal is to create solar powered vaccine refrigerators for that African country. After promoting their products at a MEDAfrica exhibit in Zambia in 2005 they had been contacted about the vital product. 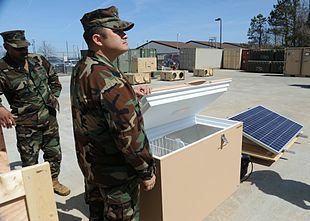 Refrigeration being a problem in the country, the ability to store life saving vaccines in a refrigerator not reliant on conventional grid electric will be a blessing to the area. The Welsch Assembly Government gifted one refrigerator to the Zambian government as well. “MedicAfrica is a major event that attracts interested parties from all over Africa and when the Minister for Health came to receive the gift it created quite a splash and attracted a lot of attention. The seeds of our recent success were sown then. It helped us demonstrate the significant advantages of our product and established an excellent working relationship,” said Ian Draisey, the director of Dulas. No date of delivery was discussed at the time of the article.